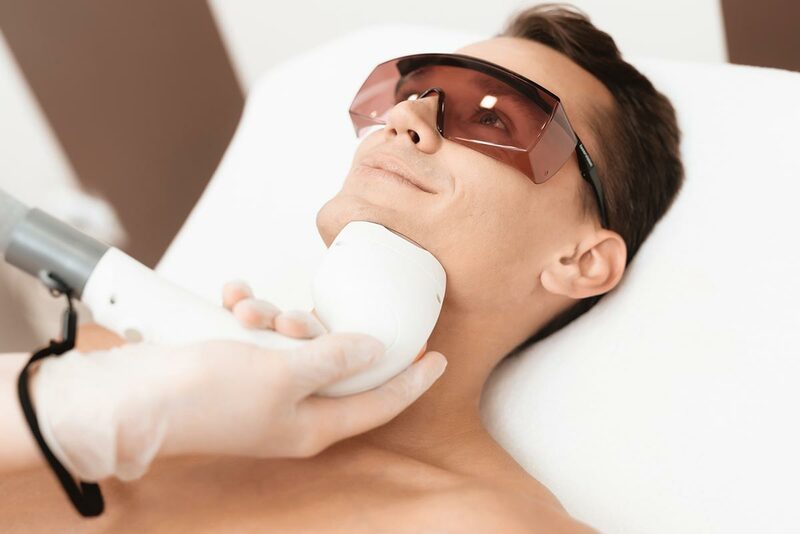 Hair removal using new generation technology. Try our highly acclaimed massage. Customers almost always return. Ala offers IPL/SHL permanent hair reduction and waxing, as well as facial care. Ala remains committed to its customers' wellbeing and satisfaction. 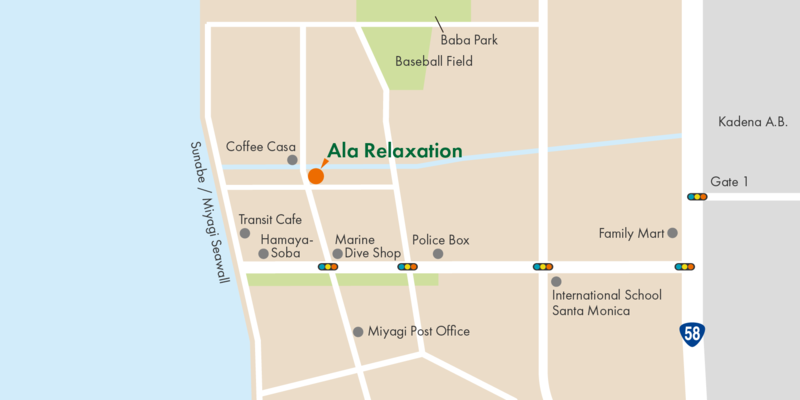 Ala relaxation has been providing quality massage therapy and body treatment in Chantan, Okinawa area for more than 20 years. Ala's therapists use a blend of massage techniques, skillfully combining the best of Thai and Japanese traditions. Massage treatments are customized to each client's individual needs, delivered with the utmost care that only years of experience can insure. Waxing, along with permanent hair removal services, are also offered, along with relaxing facial treatments. 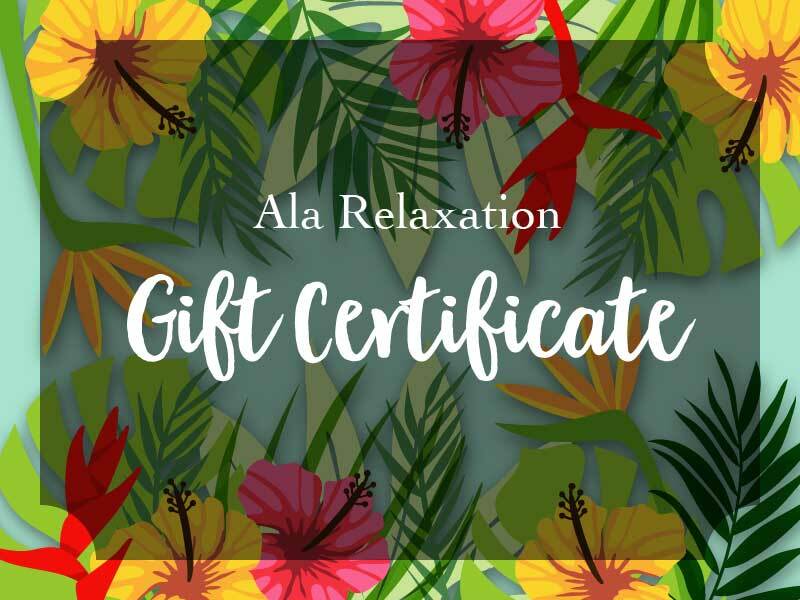 Give the gift of relaxing massage to that special person on their birthday, anniversary, or any other special occasion. Ala's certificates are especially welcomed gifts when sent by family members to their loved ones serving far from home. Our salon has only male therapists. Couple's massage is available on limited days. Please check on our calendar. From gate 1 of KAB (Kadena Air Base), head south toward Sunabe. At the first traffic light, turn right. Go straight to the Sunabe sea wall and at the third traffic light, turn right. The salon will be on your right, about four blocks down, on the first floor of a rust-colored building. In the case that we are occupied and cannot take your call, please leave a message or try back at a later time. Please note : This is relaxation massage, not therapeutic, nor sexual treatment. When you like to cancel your appointment, please call us two hours before your session.If you do not call to cancel your appointment or do not show up for your scheduled appointment, you will be charged 100% price for the scheduled service. Appointment times have been arranged specifically for you. If you are late, your session may be shortened in order to accommodate others whose appointment follow yours. Depending upon how late you arrive, your therapist will then determine if there is enough time to start a session.